Does the Affordable Housing Bill mean the end of the Bedroom Tax? How does it impact tenants now and in the future? Campaign Group Summons City Council to appear at Court. 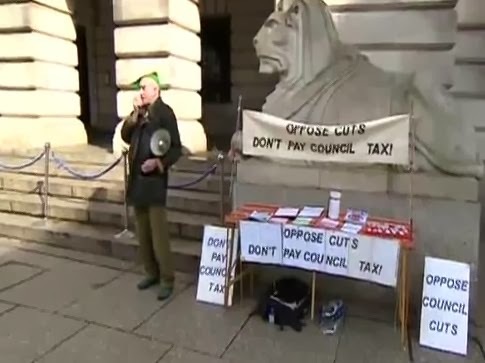 Nottingham City Council had been asked to meet with the Scrap the Bedroom Tax campaign group back in December last year and despite repeated attempts at a dialogue and giving Nottingham City Council ample opportunity, no meeting has taken place. The campaign group were informed that Cllr Dave Liversidge was willing to meet campaign members and discuss concerns the group have yet this has not happened. The group made a final request to both Cllr Dave Liversidge and Cllr Graham Chapman for a meeting but this request like others met with no response from either Councillor. 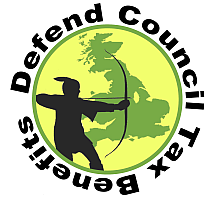 The summons today (22/5/14) is to draw attention to the Councils continued court actions against Bedroom Tax victims and the failure to follow procedures to prevent evictions or further court action. Despite claimants with arrears that are reducing and payments being made, the council are still pressing on with court action and it is because of this and other failings that the council have not taken care to avoid, the campaign group members are serving a summons to meet to discuss these matters in a more public forum. 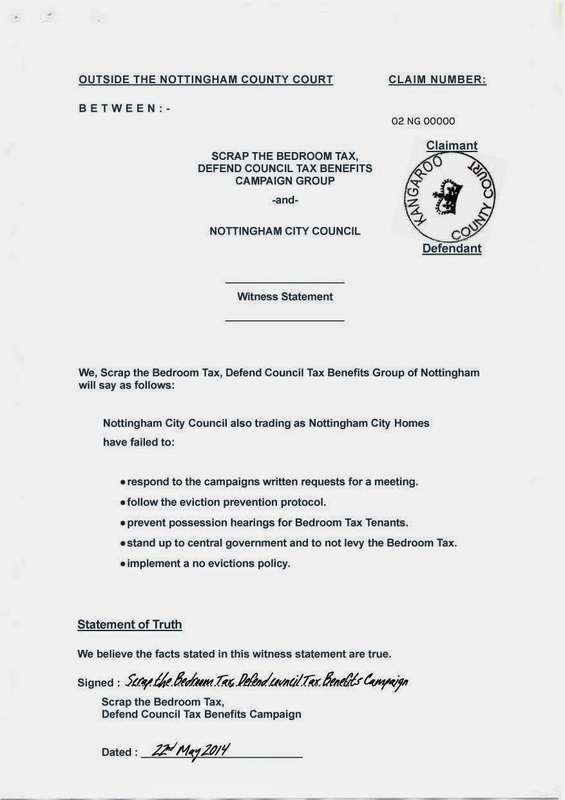 Nottingham and Nottinghamshire Scrap the Bedroom Tax Defend Council Tax Benefits campaign have requested a meeting with Nottingham City Council as a matter of urgency amid concerns that the Council are failing to follow the pre-court protocol for tenants hit with the bedroom tax. The campaign group are concerned that the council is not engaging with tenants who are in bedroom tax arrears, not giving tenants the information they need, and not trying to make arrangements with them before taking them to court. In the most recent example, a tenant who is less than four weeks in arrears and whose arrears have been decreasing since January, has received a court summons for possession of their home from the council. We will keep you up to date with the outcome of this meeting request. The Scrap the Bedroom Tax, Defend Council Tax Benefits campaign group are holding a protest against the bedroom tax on Saturday 5th April 2014 from 1pm at the Brian Clough statue (off Market Square, Nottingham). 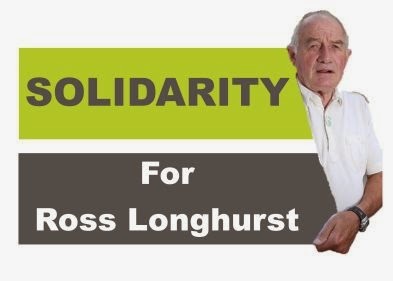 The Scrap the Bedroom Tax, Defend Council Tax Benefits Campaign group are pleased to say that Ross Longhurst is due for release later this week. The campaign group were also asked to make it clear that Ross does not want to be greeted from prison, all he wants to do is to get home. Ross Longhurst aged 72 years and a longstanding campaigner has been jailed for 28 days for not paying his Council Tax Ross refused to pay in protest and wrote before his hearing: "For the fourth year running Nottingham City Council are imposing cuts on local services which target the most vulnerable sections of the community such as children and old people. 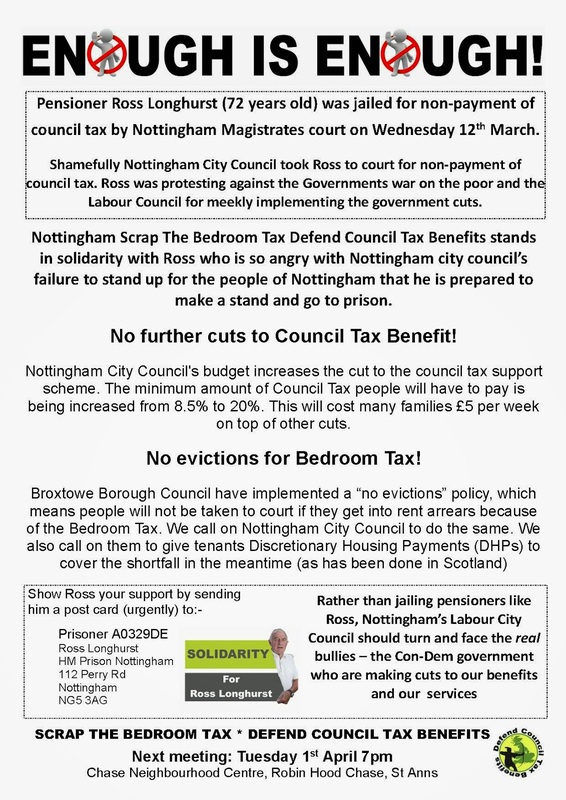 Cathy Meadows, Chair, Nottingham Stop the Bedroom Tax/Defend Council Tax Benefits Campaign gave our solidarity to Ross on Radio Nottingham and to any people who feel so angry at the injustice they are making a stand even not affected themselves. Cathy made the point that many people are being forced to choose between food, fuel, council tax and rent because of cuts to benefits and cannot afford to pay council tax; that a year ago people whose income was so low that they were considered too poor to pay council tax are now being told to pay yet their income is still low; and from this April, the minimum amount the [massive majority Labour] Nottingham City Council is charging will be 20% of council tax. Cathy made the point that the council should stop harassing people and stop stop sending bailiffs stop threatening people with eviction. Nottingham Stop the Bedroom Tax/Defend Council Tax Benefits Campaign gives advice to people on a case by case basis to help support them when they receive letters from the council or social landlord including court letters. On the same day the thisisnottingham website reported that a business man was spared prison after £4m of fake goods were found. Nottingham Magistrates’ Court sentenced the man to eight weeks in prison, suspended for 12 months. ©2012 Nottingham & Nottinghamshire DCTBC . Simple theme. Powered by Blogger.